There has been a big BOOM in recreational runners over the past few years. It seems like everyone and their mama is training for a 5K, half marathon, or even a marathon! Amy and I both LOVE to run! We both ran competitively and now jump into a 5K or two throughout the year. I've even dipped into marathons completing both the Denver Rock 'n' Roll and the Boston Marathon. Becoming pregnant for the first time was SO exciting! I knew I wanted to continue to run and be active, but I also wanted to make sure I was doing the safest and healthiest thing for my baby. Can you relate? When running mamas-to-be first learn their exciting news, they are left wondering if running is safe for their tiny fetus. While every women and pregnancy is different; it has been accepted that pregnant women can indeed continue their running regimes during pregnancy. Susan Joy, M.D. co-director of Kaiser Permanente Sports Medicine states: “It’s far more problematic for both a mother and her unborn child if she is inactive during pregnancy, gains unnecessary weight, and develops gestational diabetes than if she continues a smart running program.” That being said there is no doubt that running carries potential risks that mamas-to-be should be aware of. The goal of today's post is to give you the information you need to help you RUN SMART! I also wanted to share that as a person that loves to run, it can be REALLY hard to listen to your body when it is telling you NO. We'll dive more into that, but believe me...I get you. Is it safe for my baby? Fetal health is the main concern for expecting mamas and there is no research to show that running adversely affects the fetus. Physicians used to advise using heart rate to check level of exertion and you probably still hearing that rule of "don't let your heart rate go above 140 beats per minute during pregnancy." BUT, there is a new rule of thumb in town and it is called the talk test. Talk Test: This test is simple. The entire time you are running you should able to carry on a conversation. If you are unable to talk, you need to back it down. If you are used to competitively running, you may need to go with a partner that will keep you accountable to this rule. Other considerations: this is not a time to increase your mileage or make running gains. If you are not a runner this is not the time to start. Amy at 15 weeks pregnant. A women’s body goes through MANY changes during pregnancy. These changes include weight gain, a change in center of gravity, and excessive laxity in your ligaments. New research out of The University of Wisconsin is showing that the changes that occur during pregnancy, last long AFTER too. What do these changes mean for you as a runner? 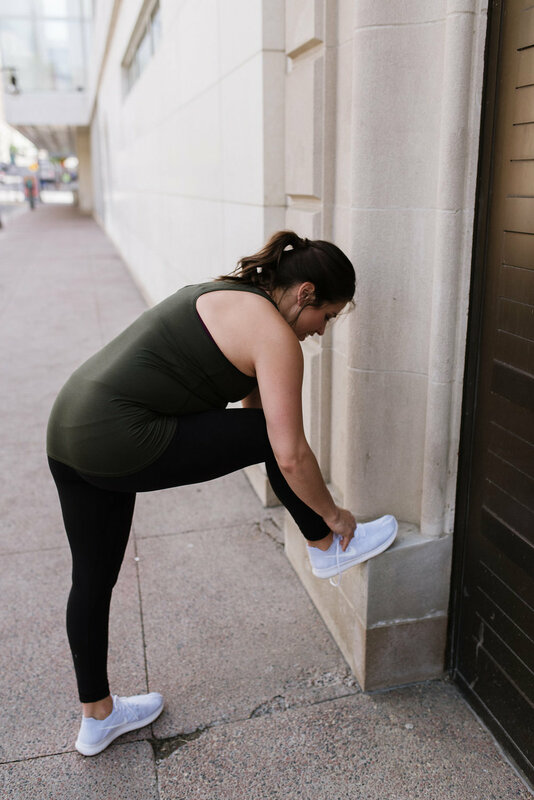 These changes alter a mama's stride and WILL continue to do so after pregnancy.1 An altered stride can leave runners at risk for injuries during pregnancy and postpartum. These types of injuries are caused by excessive force that would normally be absorbed by properly positioned muscles, but now can breakdown boney structures and soft tissue. In the studies, common running injuries in pregnant women included: low back pain, buttock symptoms (numbness and tingling), high hamstring pulls and knee pain. The study performed on pregnant runners monitored these changes by placing markers on the subjects, much like those used to create video games. The results displayed A TON of side to side motion in their pelvis and excessive low back extension during running. This can also seen in subjects 12 months after the birth of their child.1 With this new research we can make educated decisions on what should be included into a pregnant runner's training program to negate the effects of these unnecessary forces on the body both during and after pregnancy. How do I minimize the changes? Strength training, flexibility, and recruitment of deep abdominal, hip, low back and pelvic floor muscles are impetrative to running longer and more comfortably into pregnancy with fewer problems postpartum. The first half of pregnancy is a great time to recruit the deep abdominals before weight gain sets in. The muscle that you are looking to activate are called your transverse abdominals. These muscles are deep and are like a corset that has the job of keeping your back safe. Recruiting your transverse abdominals: This is subtle recruitment. Let’s start slow! Lay on your back with your knees on the couch and inhale. As you exhale, hum and draw your tailbone towards the beltline. To check if you are getting the transverse abdominal to work: place both hands at the pointy part of your hip bones and bring your fingers one inch towards your belly button and then one inch downward. Once your fingers are there during the contraction you should feel the muscle stiffen under your fingers. People that experience low back pain have a VERY hard time recruiting this muscle. Be patient and focus on trying it multiple times before the light bulb feeling occurs. Tip: If you perform a crunch/situp and see your stomach rise verse flatten you are recruiting the wrong muscles (rectus abdominis)!!! If you are using the correct muscle you should see your belly button draw towards your spine. During pregnancy, our pelvic floor is under an abnormal amount of pressure. Especially during running, it is important for pregnant women to develop pelvic floor awareness. The goal is to automatically activate the pelvic floor muscles with good running form and proper breathing instead of having to think about continually activating it. In the clinic, I find that runners and athletes actually have a difficult time relaxing their pelvic floor. It is imperative that individuals can both contract and relax their pelvic floors! We don't walk around with our biceps flexed all day, so why are we doing that with our pelvic floor?! Social expectations have a lot to do with this constant contraction of the pelvic floor and abdominal muscles. We all want flatter stomachs but you can’t activate your diaphragm fully if you are constantly sucking in your stomach. Expecting and Empowered includes pelvic floor exercises in EVERY day of the guide and we also just wrote this blog post on pelvic floor health. Runners are very strong when it comes to their leg muscles but much to their surprise most do not have lateral hip strength. Even worse women are more prone to poor hip control because we have a wider pelvis than our male counterparts. During pregnancy these issues are compounded because once we start to have changes to our center of gravity, our feet rotate outward to increase our bodies base of support. Rotating the legs outward shorten our hip muscles, which place them into a less optimal position to perform muscles contractions needed for running. To combat this, we want to strengthen our gluteus medius and minimus. That FREEBIE I talked about earlier includes exercises to do this! So look for that in your inbox! Believe it or no, most runners also have weak hip extension regardless of pregnancy. Step-ups onto a high box or stairs at home are great exercises to add in to help you strengthen this group of muscles. I would avoid this the second half of pregnancy because of the ligamentous laxity which leaves you exposed for pubic bone and sacroiliac issues. Rule of thumb: during the second half of pregnancy avoid load, deep or strenuous asymmetrical (doing movements with one side of your body, examples: lunges) movements. Keeping movements symmetrical will protect your pelvis from strain. The study out of UW-Madison showed that runners typically suffer from poor back extension strength leaving their core exposed! We can counteract this by strengthening the back during and after pregnancy. The low back gets stuck during pregnancy and movement will help it from doing that! Your body will thank you for moving and strengthening this area. In addition strong hips help protect your low back as a runner because they help absorb some of the impact. When should I call it quits? Being a runner myself, I can confirm that we are the WORST at listening to our bodies. The runner's high a lot of us experience can make it very difficult to cut ourselves off. During pregnancy it is EVEN more important to make sure you are listening to your body more and making sure you are comfortable running during this time. As a physical therapist, I wanted to share what concerns me the most about women running during pregnancy and the warning signs that you need to immediately stop your running program. 1. Chest pain, headaches, dizziness, severe shortness of breath. 2. Leaking urine during running. 3. Severe heaviness in the pelvis. 4. Feeling uncomfortable during and after running. So prevention is KEY mama and we've got you covered with our guide! Okay, so what about returning to running after pregnancy? Guidelines postpartum by the American College of Obstrictics is that running is ok usually at 4-6 week with physician approval. Clinically, my personal recommendation is starting with a CORE program followed by a walk-run program is best. Abdominal muscle recovery is slow. Everyone regardless of vaginal or C-section should use an abdominal binder postpartum to help the collagen reform and recover by helping it shorten faster back to its normal state. Laxity of the ligaments also continues postpartum and is especially high for women that are breastfeeding so consideration should be continued postpartum as well. Strength training will help reduce soreness/pain due to ligamentous laxity. In review, RUNNING can and should be done during pregnancy if that is an exercise you enjoy. But run smart ladies and the KEY is prevention. Prevent losing your stride, prevent the compensatory strategies and we can do that with flexibility, strength training and body awareness. Our guide covers a lot of these exercise in the proper sequence at the proper time. The PDF we're sending to our email list is FULL of free exercises for runners to do during pregnancy. It would be great to do prior to all RUNS! If you are already using our guide I would suggests also doing these exercises before every run! Lastly, running should not be stress provoking but instead stress relieving. So take care of yourself mama! 1. Thein-Nissenbaum JM1, Thompson EF, Chumanov ES, Heiderscheit BC. Low back and hip pain in a postpartum runner: applying ultrasound imaging and running analysis. J Orthop Sports Phys Ther. 2012 Jul;42(7):615-24.